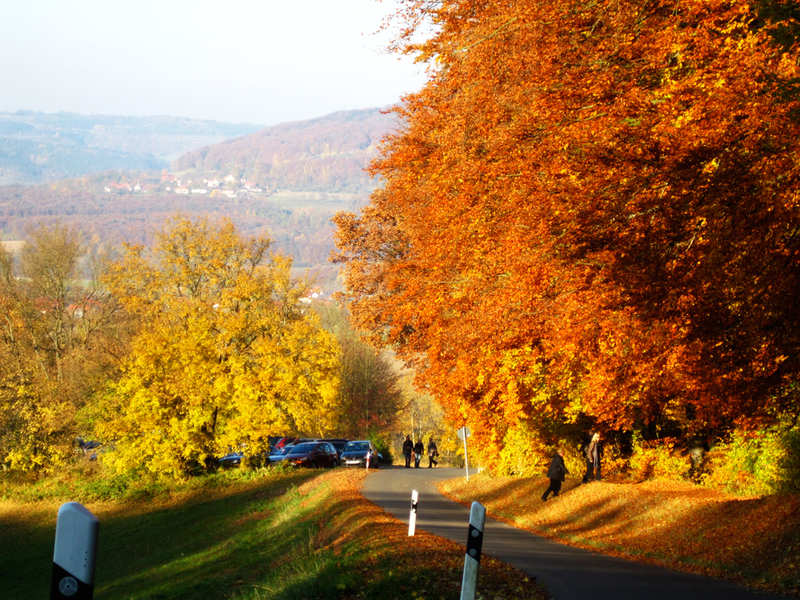 Come and taste Fall in Bamberg. Rathaus at Night in Bamberg. The Germans call it Bockbierzeit, loosely translated to bock beer time. Each fall the breweries of this region release their delicious bock beers for the winter. These bocks are may be different than bocks you’ve had in the past. They have a wide range of flavors and can be malty, sweet, deceptively strong and even pale in color. It makes beer hunting even more fun because you never know what is around the corner. You just have to be ready to lock ‘n load and consume. The breweries of Schlenkerla and Spezial even brew smoked bocks. Fässla makes one of the strongest bocks called Bambergator, that weighs in at 8% abv. Most bocks range between 6.5% to 7.5% abv. The breweries release their bocks October through late November, with special celebrations called Bockbieranstich, meaning presentation of the bock beer. Schlenkerla traditionally begins the bock season with their Ur-bock, then the other breweries follow suit in the following weeks, with Greifenklau finishing the season. There are, of course, more than just bock beers available during this time. The traditional rauchbiers, keller beers, unfiltered lagers, country beers, etc., are all out there for your drinking pleasure. Temperatures start to drop this time of year and can vary from year to year. In the fall it can be in the 50s and low 60s during the day and as cool as high 30s at night. It can also surprise you and get quit warm in the direct sun on some days and you find yourself in a t-shirt. But, unfortunately, most of the beer gardens, or beer kellers (bierkellers) as they are uniquely called in Bamberg are closed for the season. (During the Spring Beer Garden Tour of Bamberg is the time to really experience them.) It’s still plenty warm enough in October, though, to ride a bike in a pair of blue jeans and wearing gloves if you choose to ride. We don’t ride bikes on all our tours. It depends on the desire, fitness level of the group and weather. We’re flexible and you are not required to ride a bike. We’ll get you to where we are going. They call beer gardens beer kellers because many of these forested hillside beer gardens traditionally were (and are) on top the underground cellars where they lagered the beer. Sometimes people will refer to going “on” the beer keller, rather than “to” the beer keller, which when you know the back story makes sense. This itinerary serves as only a rough guide of where we will go each day. I reserve the right to switch things around to take advantage of good weather to be outside, avoid known rain days, and visit special beer events as they may arise such as bock beer release events. River boat tour in Bamberg. All breakfasts, two lunches and three dinners. One souvenir BBM! soft-sided cooler per household. Beer is included during group meals (aka company meals) and brewery tours, and on taproom visits included on the itinerary, but not informal pub crawls or café visits. The begins and ends at our hotel in Bamberg. Some meals and beer on your own. Free-time sightseeing. Our guides are available to provide suggestions. Fine Print: You are responsible for the costs of your free-time sightseeing. Be sure to read our Terms & Conditions Agreement for important details. Gratuities, at your discretion, for brewery tour guides and coach drivers. Deadline to sign up is one month before departure. We require a minimum number of guests for each tour to be guaranteed to go, so it’s important to sign up ASAP, as opposed to waiting until the deadline. Also, tours can fill rapidly and suddenly, so signing up early ensures that you will go and not be disappointed. Please share BBM! tours with fellow Belgian beer enthusiasts, your friends in general, and encourage them to join the fun! * Itinerary subject to change.